Clean, renewable sources of energy are a perfect fit for Alberta’s farms and ranches. Agricultural producers work hard to care for the land that supports their livelihood, families and communities. Farmers and ranchers deserve a type of energy production that does the same. 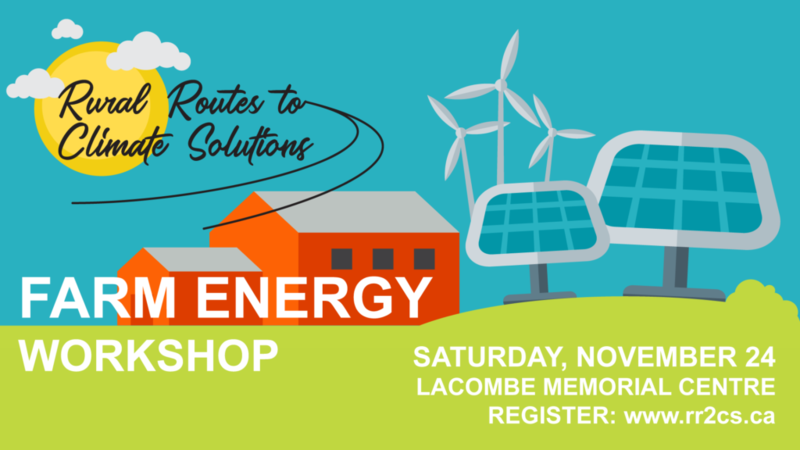 Rural Routes to Climate Solutions is holding a full-day workshop in Lacombe on the clean energy options available to producers and how producers can access funding to get these types of projects off the ground. Presenters from industry, research groups and financial institutions will be on hand to answer questions on the financial payoffs of wind and solar power, how to apply for grants and access additional financing for clean energy projects, staying on-grid or going off-grid and more. YOU MUST REGISTER AND BUY YOUR TICKET IN ADVANCE. Your registration fee ($15) includes lunch and a opportunity to speak to experts in smaller breakout groups. You’ll also hear from other farmers and ranchers who already have clean energy projects operating on their land (to be confirmed). There are only 50 spots available for this workshop. Please purchase your ticket immediately. It’ll also help give us a better idea how many people we need to provide lunch for. This workshop is ideal for greenhouse operators, dairy, poultry and egg producers or producers looking to do on-farm processing. The higher your electricity and heating needs are the more generating your own clean energy on site makes sense. And at the end of the day we will make our way to one of Lacombe’s fine local establishments for a mixer. Hope you can join us!